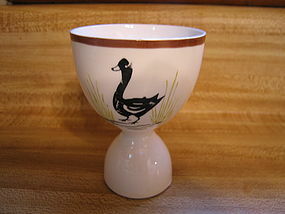 Vintage porcelain egg cup marked Japan in black. There is a 19 cents Woolworth label on the bottom There is minor loss to the finish, as well as a couple of tiny flakes on the bottom rim. I can see a small amount of crazing to the base, appears to be under glaze and could have been part of the manufacturing process. I need your zip code to calculate the postage.